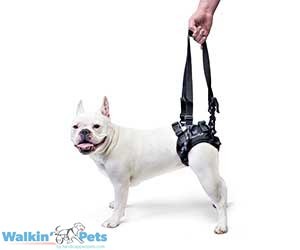 The Walkin' Wheels Rear Harness is used to support your dogs hind quarters. This harness is compatible with the Walkin' Wheels Wheelchair, and can be used instead of the Leg Rings. Your pet can do their business while the harness is on. The handles included are adjustable in a range from 4.5" to 27"
This Walkin' Lift rear support harness for dogs can also be used as a front harness on dogs that do not have a large chest. It can also be used with the Front Wheel Attachment, instead of using the leg rings. The outside of the harness is made from a durable canvas and trimmed to perfection for comfort. The inside of the harness is made from a soft fleece lining giving your dog the most comfortable fit while wearing the harness.